Cushion-Ease® safety mats are made from a resilient rubber anti-fatigue mat with an anti-slip surface texture and multi-nib backing to further enhance the ergonomic support of the mat. 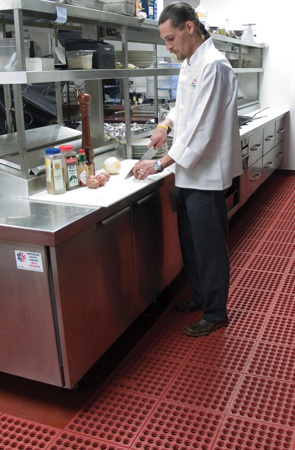 These kitchen mat tiles feature a large hole drainage system which facilitates the removal of liquid and debris from the work area and makes them ideal for factory work environments as well. Black mats are grease resistant, while the red mats have extra nitrile making them grease proof. Easy to snap together on-site for custom work station platforms. Overall mat thickness is 3/4".